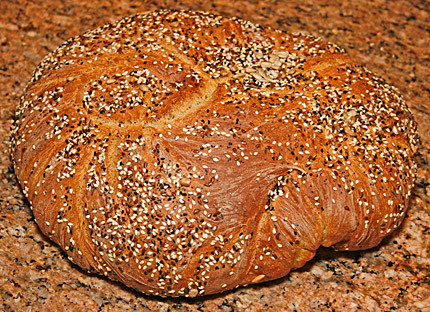 A crusty, flavorful “light brown” multigrain bread, ideal for sandwiches or breakfast toast. Mix all ingredients in a mixer, or by hand. Mix for 3 minutes in a mixer; about 5 minutes by hand. The exact flour/liquid mix will vary with the ingredients, and in particular the exact character of the flours you use. The dough should form a sticky ball after a minute of mixing. In a mixer the dough should be moist enough to stick to the sides and bottom of the mixer bowl, but should still mostly form a sticky ball on the dough hook, not a loose batter or a firm smooth-surfaced ball entirely stuck to the bread hook of the mixer. Add beer in .25 cup increments if the dough seems too dry. Add .25 cup flour if it seems too runny and batter-like. Spray Pam into a large bowl, and scoop the dough into the bowl. Cover loosely with a dish towel and set aside for 2 to 3 hours. Form the final dough shape (boule, long loaves) and let the dough rise a final time for 1.5 – 2 hours. 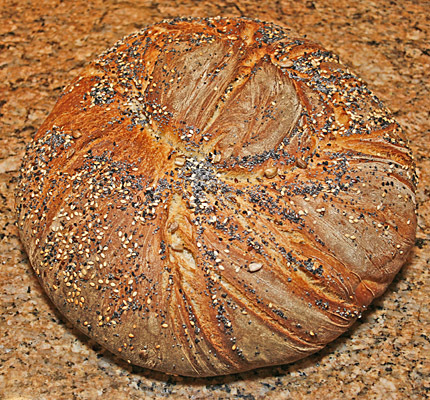 After you have formed the final loaf shape, roll the top surface of the dough over a plate of several additional tablespoons of the seed mix, if you prefer. Use the Dutch oven baking method for the best results. See my general notes on yeast bread baking for more information on what brands of ingredients and equipment I use. Also, I have notes on the Dutch-oven bread baking method that I usually use for this bread.